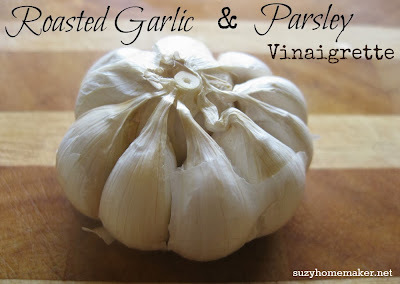 Recently I roasted a couple of bulbs of garlic and had lots left over. You can read about it here. I decided to make a vinaigrette out of the garlic. I chose to pair it with some parsley from my herb garden. For this recipe I used my food processor. It would work just as well to mince the garlic and parsley and just whisk everything in a bowl. Because doesn't everyone keep their dressing on the windowsill?